It’s amazing how a food tradition can travel. A couple of Sundays ago I stopped in at Cocina Latina on Albemarle Road in east Charlotte, thinking about maybe a breakfast burrito. Fausta Salvitierra from Hidalgo, Mexico, and her sons have made the place a favorite spot for Mexican family cooking, especially “tortas” (baked sandwiches) and traditional lamb “barbacoa” (a relative of barbecue). Behind the counter I thought I saw empanadas. 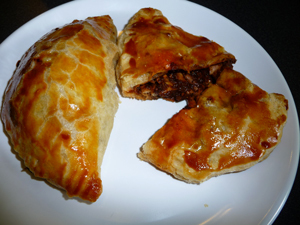 I love those dough pockets stuffed with meat, a specialty of Argentina. How’d they get to a Mexican place? Almost 200 years ago, the ancient mining district of Cornwall in England sent skilled immigrants to mines all over the world. They brought along their distinctive food, called “pasties.” Dough is folded over a meat stew then baked, creating a filling lunch that stayed warm into the middle of a hard workday down in a cold, damp mine. In Hidalgo, they changed a bit. Instead of English-style beef stew, Mexicans made fillings of beans with chorizo sausage, chicken mole (say “MOLE-A,” the dark sauce popular in central Mexico), ground beef with hot peppers, or arroz (sweet rice custard). So much history – English, Mexican, and now Carolinian – all wrapped in a warm flakey crust!